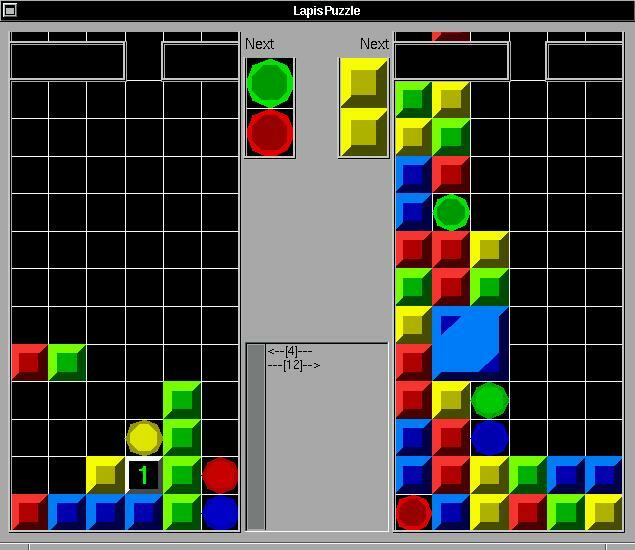 LapisPuzzle is a tetris-like game which challenges the player by making the opposing team's victories count doubly against the player and vice versa. Play it and find out! Sparker jewel will destroy unit with the same color. White Sparker (Diamond) will make all unit with share the color of the block it falled on disappear. Timer Stone will fall after current player's movable blocks reach the bottom line and already cause all destruction effects. The number of timer stones that will fall is displayed on the top right of each view. Once the number reach 0, a timer stone will turn into a normal unit. If a set of cells with the same color form a rectangular layout, they will merge into a bigger cell. Bigger cells will cause more timer stones to fall in opponent's side. Destroying block in chain will cause multiply effect.